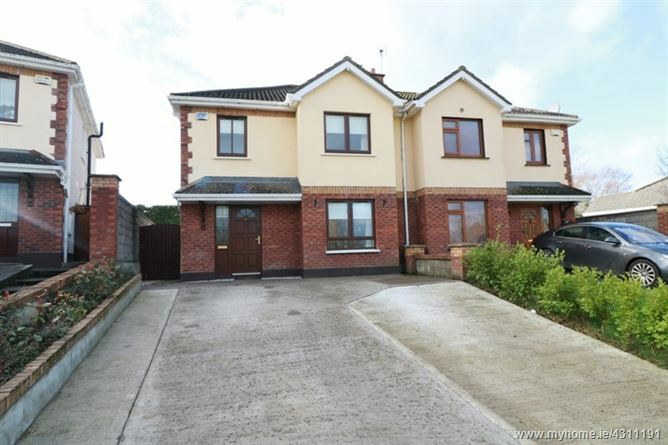 Maura Donohoe Auctioneers are delighted to introduce to the market this spacious, well presented and maintained three bedroom semi detached residence with generous front and rear gardens overlooking a communal green area in the much coveted Ard Evan development of Monasterevin. Accommodation comprises of an entrance hall with guest wc, fully fitted kitchen/dining area, stylish living room, three first floor bedrooms, master en-suite, bathroom and spacious attic storage room. Other features include oil fired central heating, alarm system, double glazed uPVC windows and external doors, rear patio area, ample off street parking and more. Solid wood floor, blinds, light fitting. WC, WHB, tiled floor, light fitting. Featuring a marble fireplace, wooden floor, light fitting, coving, blinds, double French doors to dining area. Newly fitted kitchen with granite worktops, integrated cooker, hob & extractor fan, dishwasher. Large breakfast island. Polished porcelain floor, light fittings. Double patio doors to patio area. Carpet, curtains, blinds, light fitting, built-in wardrobes & vanity unit. WC, WHB, shower cubicle, light fitting, fitted accessories. Partially tiled. Carpet, light fitting, high gloss built-in wardrobes, dressing area. Carpet, blinds, light fitting, built-in wardrobes, fitted single bed. WC, WHB, bath, recessed lighting, blinds, fitted accessories. Fully tiled. Fitted storage units, carpet, recessed lighting, 2 x Velux window (certified). Stair access.